In a sense, I hated to do a flower, but gardening and cooking and photography are my passions. The garden is in full second bloom and it's great. I shot many, many shots this weekend. On this one, I tried to get the shot in the garden, but I could not get the right angles. So, I brought it inside to the "studio". I did some shots and was auditioning two. In the meantime, I put the subject in the window. The next morning, I asked Lynne what she thought. She said that they were good, but too bad the yellow crown didn't show up. I said, "Huh?" When I went to the window, sure enough there was a yellow crown. I reshot the subject to get the crown. I used two 500W lights with umbrellas. I shot down on a mirrored surface that was refelecting the black background (this seems to give a more uniform background - don't know why). A little level and curve adjustment and some sharpening with unsharp mask. 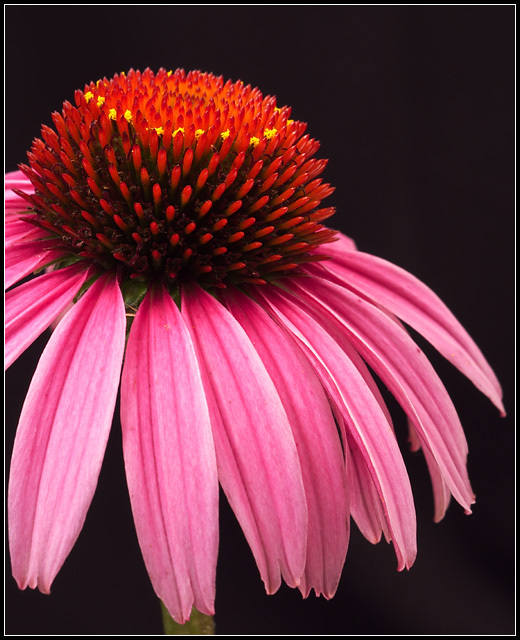 Nice coneflower, the the center seems a lot redder than is natural - maybe its just late in the cycle. Nicely dramatic - good, vivid colors, and the use of the black background brings it out nicely. I like that it's off-center and cut off to the left, and I have no idea exactly why that works so well, but it does. Incredible shot. The color, focus, contrast and the slight splash of yellow is a nice tough. I normally don't like flower macros but this is too good to not give a 10.
wow.. what a unique flower shot. This is excellent.. the only worthwhile flower entry I've seen so far this week. Great macro. Wonderful focus and clarity. The center is really full of detail and beautiful to look at. colors are wonderful, background works perfect. nothing distracting from the beauty of this image. great shot. Beautiful shot. The colors are just right and the black background is perfect. Gorgeous......the crop is a little cramped maybe.....a bit more of the bg at the top might add to the image impact.....sides and bottom just right. Very nice! Good saturation and the bg makes it pop. Texture is excellent. This is beautiful... very professional looking. I like the way you have it on a black background. Everything is perfectly in focus, Very well done. I could definitely see this on the front of the magazine you chose after going and looking at the website you posted. However, I think you should have thought more about putting the border as it doesn't look to me like the magazine has a border on it... it goes all the way to the edges except for maybe just at the top. Beautiful photo though! I'm noting the border, but I've decided not to take away from your score because of it. -10- I think you should think about submitting this to that magazine... :-) Good luck. Extremely nice echinacea. Well shot, perfectly exposed, distraction-free background. Proudly hosted by Sargasso Networks. Current Server Time: 04/21/2019 04:06:46 PM EDT.